Second place boat fighting for the finish. On Thursday, June 7, RHS hosted its fifth annual boat regatta. This is a race that the students participate in each year. Math teacher Christine Anderson organizes the event, and had some of her classes participate for a grade. About one month ago, the student started creating their boats. They must make this boat out of cardboard and duct tape under strict rules. During the competition, two students must get into the boat and paddle their boat across the pool; if they sink, they are out. These students must make it across the pool in any way they can. If their boat sinks or falls apart they have to swim to the end. They go through a series of rounds and each round the teams start getting eliminated. Then at the end, they have awards that they give to the first and second place, also awards for quickest sink, and best sportsmanship. Quickest sink was won by “Bowers Air Fortress” and best sportsmanship was won by “Jenny”. This year there was 23 boats, having a mixture of all the classes, including seniors who came back after graduation. There were four rounds in total, with the final round being the most anticipated. Three boats were sent into the water and it all came down to the wire. 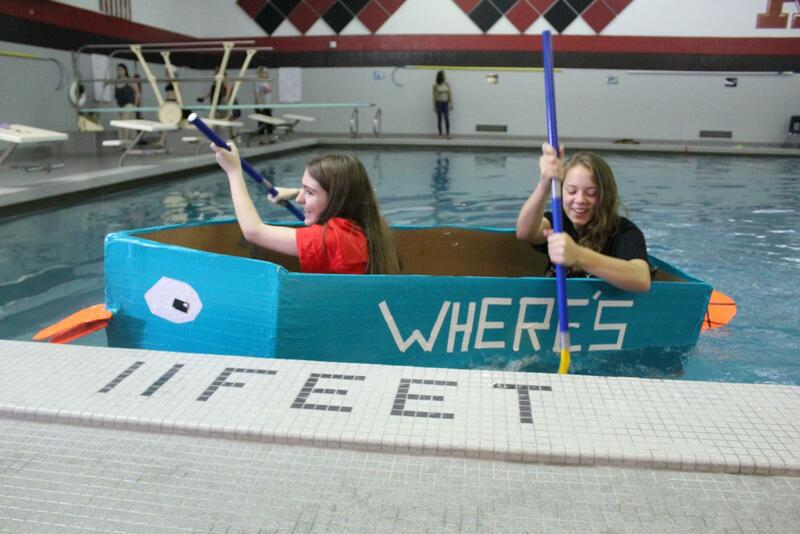 The winning boat was “Britney and Jordan” with freshmen Brianna Moe and Jordan Fritz inside. They won due to not making it to the finish first, but making it to the finish with them still in the boat and the boat still intact. Taking second place was “Perry the Platypus” with freshmen Selena Lulic and Julia Mulder in it. “I thought it was fun, nerve racking, but a lot of fun,” Fritz said.